VOGONS • View topic - Possible fix for Mobil 1 Rally Championship a.k.a. Rally Championship 2000 !!! Possible fix for Mobil 1 Rally Championship a.k.a. 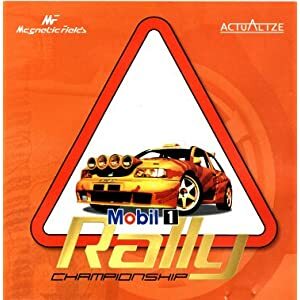 Rally Championship 2000 !!! I think I finally cracked it, on how to play one of my favorite rally games again, so I want to share it with you. When driving a rally stage after a while the sounds became out of synch with the actual gameplay, this happened randomly, but could be triggered by crashing your car. This rendered the game to be unplayable for me. that is..... until now !!! I got the idea for this fix trying to solve a framerate problem for another game, but that is not important right now. The thing is that this game was designed back in the day when there were no multicore CPU's and this game makes heavy use of just one CPU, when running it is constantly at 100%. I think that when there is a spike in CPU usage Windows will force it to another CPU for processing and the end result is that the sound will become out of synch. So the obvious solution would be to make the game use only one CPU and that's what this solution is all about! - Search for the process called: RAL.EXE and right click on it. - Now a window will appear in which all available CPU's are shown. Windows selects all CPU's by default, but we don't want that. Now uncheck all CPU's until only one CPU is left checked and press OK, it doens't matter much which one as long as only one CPU is checked. - Activate the game again by left clicking on its name in the task bar. This has solved the out of synch sound for me so far on Windows XP, but this might also work on Vista and 7. A minor thing is that you have to repeat this every time you want to play the game, there are ways to automate this but I haven't found one yet that was less of a hassle than repeating the process. Re: Possible fix for Mobil 1 Rally Championship a.k.a. Rally Championship 2000 !!! Alt+Tab and using the Task Manager while games are running can be problematic, particularly with older games: crashes, messed up desktop, etc. You can permanently set the default processor affinity on PE executables by modifying their headers; which usually works unless they have self-check mechanisms that include the header. A search for "imagecfg" should find plenty of resources explaining the process. Thanks ripsaw, I will look into imagecfg later. But I think I cracked that one too, and be solved by placing the line agpmode=2 in the ral.cfg file. At least after I did this I couldn't reproduce the crashes on my system anymore, whereas the game would always crash without this line. You can use Microsoft ACT 5.x and make a custom fix for the game with the flag "SingleProcAffinity" (don't forget "EmulateHeap" as well). That's how I got it working properly. But I think I cracked that one too, and be solved by placing the line agpmode=2 in the ral.cfg file. Where do I find this file? Do I have to create it? I only found the ral.dat and ral.zog. Edit: Ok, I found an editor with tons of extra options and this fix works out of the box. Not only it increases the maximum framerate but also clears up the guru meditation. Thanks for the tip, I never really got around with ACT, but if it works it works. Imagecfg works great for me though, even on Vista 64 bit. By the way the ral.cfg file is only used after the game is patched and can be used to make custom alterations to the game. There was a website which explained all the variables that could be put into the the ral.cfg file, but I can't find it anymore or the site is down. There is also a tool to configure ral.cfg called Ralwiz, but it only works on XP for me. I just installed the game. Works perfectly. But, when i finish the first stage/os, the very first race in first championship, game shows score and times tables, and then damage test table. You know pass, failed. There i press Enter, to proceed. But, next shown table says, that i retired, and game throws me into next competition (not next stage!)... What am i supposed to do? If your car doesn't pass it means it is trashed, the rally officials will not allow you to race the next stage for safety reasons. When you are in the service area screen you can see the condition of all your carcomponents and repair and adjust your car. The game will look specifically to the condition of brakes, steering, suspension, lights and tires but not to the condition of the engine and drivetrain. I don't have a clue, the procedure you described should work. I don't have any problems saving the game. What Windows version are you running? I know this post may be old. But I also know there are still enough of you out there (just like me) that feel the need to reinstall this game from time to time and play it again. Most of us, unfortunately, encountered the Guru Meditation error. Personally, I encountered it most of the times on Arcade 2, Level 2 - Tyrones Ditches, not far from the beginning of the race (2-4 checkpoints passed at most). And yes, it happens mostly while passing through dirt, or right after. I've been looking for 2 years for a solution over the Internet. Tried ACT 5.x, changing affinity, working with ralwiz and more. Nothing really did it. Till something came to my mind just today, 3 days after upgrading to Windows 10 on my laptop. I decided that I should change the process' priority to Below Normal (I was running in Windows 7 compatibility mode, otherwise it would <<Guru Meditate>> right after launching the game). It worked. It finally worked. I finally managed to get past that race. I will continue this reply by specifying more details on my specs & other probably relevant stuff. -> Process' priority set to "Below Normal"
-> Resolution 1024x768@16Bpp (for some reason, I cannot change to 32Bpp in-game) + on video options something ( I don't recall at the moment) is set to double. Everything else maxxed. I hope this helps anyone who wants to (re)try that beautiful game today again. Have a good day/ evening/ night! P.S. : As I've mentioned, I tried it with "Below Normal" priority, but you may try with "Normal" priority too. It might work, I didn't test it (yet). The idea (mine, at least) was to get the game to lag a little bit, though I'm sure it didn't drop under 30fps. All I didn't want was not going up to 60-64fps to avoid the game crashing. The only way I succeeded was to use a very high anti aliasing enough to drop the fps (there was a stage that crashed without guru meditation error and nvidia internal framerate limiter didn't help there). Forcing a higher resolution using dgvoodoo2 D3D wrapper also helped a lot. Yeah, I still have the Guru Meditation error as well, what I said earlier about using the agpmode can be ignored. I have it only on the Northern Ireland stage, don't remember the name as I haven't installed the game at the moment, but it would always crash when I drove through the mud at the farmgates and I could avoid the game from crashing by driving through the grass away from the mud and gates. I think I read somewhere that this bug was introduced with one of the patches and it wasn't in the vanila game. Just a heads up. Ive been following this topic for a couple of days now and thought I'd give it a try in WINE. I am not getting any crashes in any of the places you guys mention. If it's not running fast enough, it won't crash. What do you mean? "If it's not running fast enough?" I just wanted to point these guys in the right direction. How can it be a patch fault if i've got the game running fine with said patch? Bladeforce wrote: What do you mean? "If it's not running fast enough?" If the game runs above a certain frame rate at these locations, it'll crash. Hello again! In the meantime, I tried running it on my PC (i7-3770 @3,9GHz, 16GB RAM, MSI GTX 970 4GB). What I did to run it on my laptop (specs in a previous post) didn't do the trick here - obviously - and the game wouldn't have dropped under 60fps. I tried NVIDIA Inspector. No luck, couldn't find the FPS Limiter there. Tried MSI Afterburner (since I've got the MSI GPU). Again, the limiter wouldn't work. I should mention I'm using Fraps to see the fps. MSI Afterburner was "trying" to get it under 60fps. It could do it for 3 seconds or so (reaching 57fps) but after that, it would go back up to 60fps. So I googled around for other tools to limit my fps (or even my CPU speed.. or at least stress it enough to make it run slower). And I found EVGA PrecisionX 16 (installed through Steam). This app's framerate limiter worked like a charm. I set it and kept the game running @29fps. Never gone higher. The game was smooth enough really, so I could finish the arcade mode just today. After 12 years, great achievement . So yeah, just wanted to let you guys know that there's (always) an alternative to limit this game's fps. Happy racing! @n20osboy, Couldn't you use Rivatuner Statisticsserver, that comes with MSI Afterburner, to set a max framerate? I use it all the time and works great, though sometimes with older games you have to set the detectionlevel higher for it to work. Both MSI Afterburner and EVGA Precision uses the same underlying software to limit framerate.. So I can't explain this magic. This game isn't compatible with g-sync, not surprisingly. If like me you're getting an access violation as soon as the game tries to start and if you have a g-sync monitor, then DISABLE GSYNC in NVidia options. This fixed it straight away for me. My set up is Windows 7 64 bit, Intel Xeon something or another, GTX 970. I used the cmd method to force low priority and single processor affinity as helpfully described by another poster. Still got the error towards the end of the last track, first arcade - I'll give the EVGA PrecisionX 16 frame limiter suggested by n20osboy a go. While I'm here... Just played this game for the first time in many years, I was worried that I'd be disappointed but it's just as good as I remember it being. The way the arcade version functions and the track design are particularly good IMHO (esp considering how old this game is!). Nice to see others still enjoy it also.